The ever increasing worldwide use of forest tree products, which coincides with the diminishing of natural forests, necessitates programs for efficient tree farming. 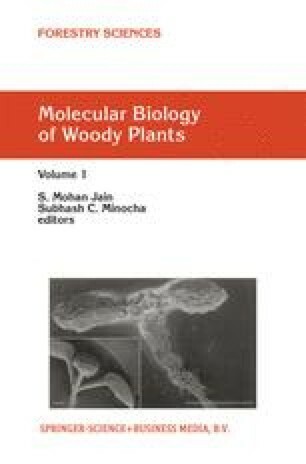 For this purpose, there is a demand for accelerated tree improvement strategies that aim at developing trees as wood-producing crops with both improved trunk performance and specific exploitation characteristics. Objectives of primary importance to the forestry industry are the genetic control of traits such as growth, adaptation to environmental stress, disease resistance, wood uniformity, specific gravity and fiber quality. With classical breeding these demands will not be fulfilled within a reasonable time span because of the long generation time of trees. To meet these needs, forest trees are anticipated to become major targets for genetic engineering and molecular breeding in the coming years. Biotechnology now provides the necessary tools to solve many of the problems faced by conventional tree breeding programs, for example by the establishment of genetic maps of forest trees species such as poplar (Bradshaw et al., 1994) and the generation and potential use of DNA marker-assisted selection in breeding programs (e.g., Cervera et al., 1996). Furthermore, plant genetic transformation has now become a common technique for the introduction of novel traits into a wide range of tree species both for basic research and for applied purposes.